TFD » Blog » Posts tagged "autumn wedding flowers"
October is a particularly spectacular month, garden’s are awash with colour, rich reds, seductive burgundy and deep oranges, As garden leaves begin to change the leaves and flowers emerge with darker richer hues it's certain to say autumn is upon us. Though the colour range is not as varied as summer, there's still plenty to choose from. If you're after an autumn wedding then why not choosing flowers that reflect the season? Whether you’re looking for autumn bridal inspiration, wedding centrepieces, exquisite wedding flowers or new ways to decorate your indoor reception space, with so many flowers to choose from, there’s plenty of colour and texture to play with. Rich hues, unique decorations and plenty of texture are the trends for this season. Unlike like summer's palate of bright shades, autumn is full of depth, richness and character. Woodlands are awash with vibrant colours and abundant with chrysanthemums, berries and garden roses, and there’s plenty of texture, with the autumns thornless blackberries, textured Celosia and the delights of autumn hued pincushion. Fall wedding flower trends lead to lustrous, rich colours, arrangements in a variety of rich shades, vibrant hues of red, orange and yellow paired with elegant touches of gold, silver and copper. When choosing blooms for your big day the best way to get the freshest flowers is to choose wedding flowers by season. Seasonal flowers are fresh, often beautifully scented and reflect the season accordingly. Bridal bouquets stun with seasonal arrangements of poppies with dark centres for depth, Hypericum berries, exquisite cockscomb in rich shades of plumb or red and lamb’s ear leaves. This autumn rich shade will become increasingly popular, dark purple wedding flowers and burnt orange wedding flowers, amongst other earthy tones; distinct shades that announce the end of summer and the beginning of the new season. This season, it’s all about texture and rich hues, as classic flowers continue to take the lead in fall weddings. When considering your wedding colour scheme, opt for rich autumn shades, dramatic, deep tones that reflect the vibrant tones of the season and pair with rich contrasts, copper, gold and forest greens. Lush, sophisticated full figured dahlias and garden roses are key to capturing the essence of this season as they come in rich shades of purple, plum, orange, red and burgundy, helping you create the perfect fall colour scheme.For added texture and complementary colours calla lilies and hydrangeas in greens and purples add richness to bridal flower arrangements. Move away from the loosely gathered arrangements of summer wedding, country garden bouquets, to autumns more structured floral arrangements. Autumn bouquets will take on a denser, fuller appearance in shades of red, orange, plum and burgundy all smartly presented with hand tied ribbons, textured fabrics and sashes. With plenty of wedding flower ideas to choose from, celebrate the new season with our exquisite range of wedding bouquets this autumn, a beautiful collection of wedding flower designs that perfectly reflect the new season. Deep wine hued garden roses, matched with berries, Celosia in rich shades of burgundy, red, pink and orange and autumn leaves carefully wrapped with a ribbon, makes for a striking bouquet which perfectly captures the autumn season. Pumpkin Red. Is full of autumns favorites, dahlias in shades of plum, orange garden roses, white Bouvardia and lush autumn leaves in forest green, burnt orange and burgundy, beautifully wrapped in white ribbon. Orange Dream. Tropical foliage, orange tulips and orange roses, green hydrangea, mango calla lilies, green berries and red roses come together to make a stunning autumn bridal bouquet. Rose Devine. A fusion of peach roses, purple roses, wine red roses, green hydrangea and blue veronica come together beautifully for a distinct arrangement that are sure to make a statement. Purple Dreams. A beautiful mix arrangement made up of purple lisianthus, cheery red roses, deep red berries and green shoots make exquisite bridal wedding bouquets. Purple Mist. A beautiful bouquet of peach roses, red berries, purple eaustoma, purple calla lilies and foliage make great wedding bouquet, full of rich shades, texture and is brimming with character. Buttonholes. Groomsmen can match accordingly with fuller looking wedding flower buttonholes using single flowers similar to that of the bridal bouquet, paired with autumns leaves and foliage. 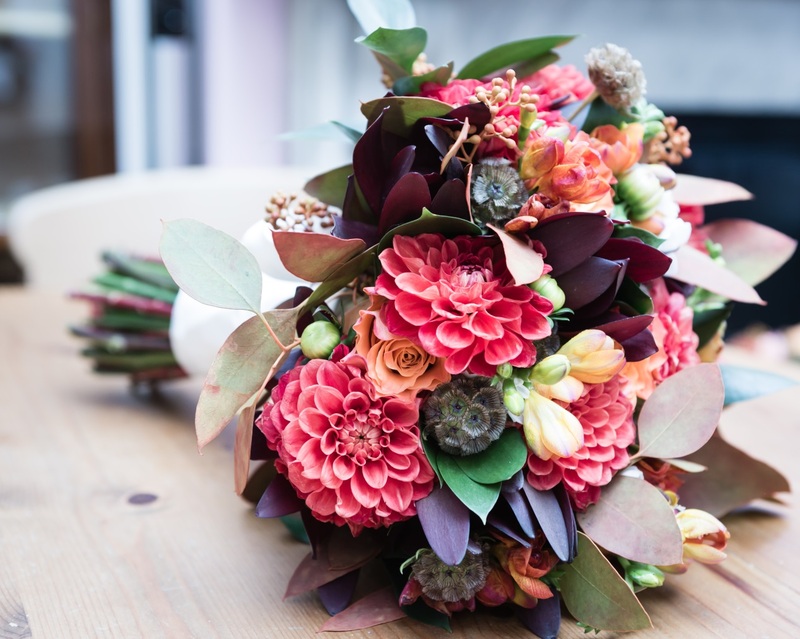 Earthy burgundy, red or orange leaves sum up autumn beautifully, compliment bridal bouquets and make spectacular additions to buttonholes for groomsmen to wear. Autumn hues, reds, oranges, plums and burgundy dazzle against contrasting forest green foliage and flower buds. It’s the perfect time for vibrant shades, take a look at our autumn favourites for inspiration. Dahlias. Dahlias are striking flowers that have made a comeback and are set to increase in popularity this season. Whether you teach for deep reds, muted purples or plums, dahlias rich autumn shades and full figure make them fitting flowers in bridal bouquets and floral buttonholes. Roses. For the autumn season, garden roses in burnt orange and forest green foliage make stunning buttonholes for groomsmen to wear. However, if you're looking to move away from autumns earthy tones and keep it bright, roses in bright orange, red or dark yellow work just as well. Match with berries for added texture. Purple Blossom. To continue that just picked meadow look, reach for purple daisies, known as 'September flower,' make fitting additions to flower arrangements and add a vintage flair to wedding bouquets. For a distinct Boho look this autumn, consider an arrangement of green mixed herbs, lavender, wheat and blue veronica for added flair. If you’ve fallen for autumns vibrant hues and taken a liking to any of the above flower designs, Todich Floral Design will be happy to assist in putting together exquisite wedding flowers, that will beautifully capture the essence of this beautiful season.